There has been an increasing trend in the United States toward consumerism , a trend that is reflected in more people eating away from home; the use of dietary and herbal supplements; foods for specific groups (e.g., dieters, women, athletes, older adults); the use of convenience and functional foods ; and ethnic diversity in diets. Mainstream populations in developed countries want low-calorie, low-fat foods, as well as simple, natural, and fresh ingredients. Internationally, there has been an "Americanization" of diets through the growth and use of fast-food restaurants and convenience foods . In developing countries there is still a need for some basic foods, and governments and the food industry are working to develop products that can reduce international food shortages and nutrient deficiency problems. Internationally, the proportion of money spent on food eaten away from home, as well as the number of restaurants, has been steadily increasing since the second half of the twentieth century. People may dine at formal, sit-down restaurants, at fast-food eateries, at cafes, or they may purchase food from street vendors. 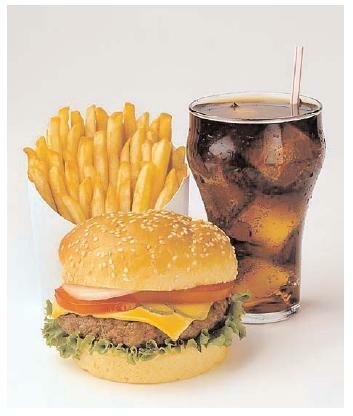 Fast-food restaurants have become very common, and are visited by all types of people. The growth and popularity of fast food has come to be known as the "McDonaldization" of America. In the United States, eating in these restaurants has decreased slightly among heavy users in the 18–34 age group, but has increased among other groups. Their popularity has also increased internationally. This simple meal demonstrates the complicated relationship between a culture and its food. In the twentieth century, Americans' preference for quick, portable meals popularized the fast-food burger. Over time the popularity of fast foods in America contributed to an epidemic of obesity. Many eateries now offer the option of larger serving (portion) sizes for a nominal additional fee (a "super size"). Eating away from home, and the shift to a more sedentary lifestyle , has been linked to the increasing rates of obesity in the United States. Obesity, a form of malnutrition, is commonly defined as a body mass index over 30. Being overweight is defined as a body mass index of 25–30. There has been an increasing rate of obesity in the United States, especially among children. Obesity is now considered a national epidemic in many developed countries (such as the United States) but some persons feel that this concern has also caused a stigmatization of the obese . Despite a growing rate of obesity in developed countries, undernutrition remains the most common nutritional problem in developing nations. The combination of protein deficiency and energy deficiency is commonly known as protein-energy malnutrition (PEM). This form of malnutrition is most common in underveloped and developing countries, but also appears in geographic pockets of developed countries. About half of all Americans try to lose weight, or maintain their weight, every year. In an effort to lose weight people purchase weight loss pills; special herbal supplements; and formulated weight loss drinks, foods, and diet bars. People also join health clubs or spas, or buy special weight loss and exercise equipment, in an effort to lose weight and improve their health. Among the common types of diets people follow are food-focused, celebrity, exchange, and supplement-based diets. Food-focused plans, such as the grapefruit diet, the banana diet, or a wine drinker's diet, emphasize consumption of only one, or a few, foods. Celebrity plans generally have the backing of a celebrity, and exchange plans lump together into food groups items with similar calories, carbohydrates , proteins, and fats. Some diets incorporate a commercial meal, snack bar, food, or beverage that must be purchased. Pills, liquids, or powders that contain nutrients and other ingredients are now readily available in stores. Supplements that contain herbs (or some herbal components) are growing in popularity. However, supplement production and use is not always well regulated, so consumers must be careful about what they purchase and consume. To satisfy individuals who want to eat well at home but are short on time or do not want to prepare elaborate meals, many eateries also offer take-out meals or items. Fully or partially prepared "TOTE" (take-out-to-eat) foods, including home-delivered meals, are generally referred to as convenience foods. As more women (the traditional preparers of family meals) enter the labor force, people's desire to save time increases along with the use of convenience foods. The "TV Dinner," a registered trademark of the Swanson company, first appeared in the early 1950s as women began leaving the kitchen for work outside the home, changing the way America ate. According to company lore, the product was invented by a sales representative who was left with 270 tons of unsold Thanksgiving turkey after the holiday. Inspired by a food tray with compartments he had seen on an airline, the representative proposed a frozen, prepared dinner for retail sale. The first frozen dinners—featuring turkey, stuffing, gravy, sweet potatoes, and peas—went into production in 1954. The following year, Swanson sold 25 million of them. The term functional food is often used in reference to foods that have nutrients (or non-nutrients) that might protect against disease. The term is used when referring to foods that have been fortified , have specific phytochemicals or active microorganisms added, or have been developed using genetic engineering techniques. However, all foods can support health in some way, and there is no legal definition of functional food. In addition, the actual benefit of these foods, if any, can vary and is open to interpretation. For example, both a candy bar and orange juice may have additional calcium added, and can therefore be called functional foods. The consumer must determine the benefit of such items. People now eat foods with origins in cultures other than their own, especially in the United States, where almost all dishes originated elsewhere but have been modified to suit the tastes and popularity of the mainstream population. Since the late twentieth century, however, there has been an increased incorporation of ethnic cuisines into the American diet, including foods from Asia, the Middle East, and Latin America. This trend is part of a larger movement toward diversity in all aspects of life. Although all humans need food to survive, people's food habits (how they obtain, prepare, and consume food) are the result of learned behaviors . These collective behaviors, as well as the values and attitudes they reflect, come to represent a group's popular culture. SEE ALSO Convenience Foods ; Dieting ; Eating Habits ; Fast Foods ; Functional Foods ; Obesity . Carney, George O., ed. (1995). Fast Foods, Stock Cars, and Rock 'n' Roll: Place and Space in American Pop Culture. Lanham: Rowman & Littlefield. Gabaccia, Donna R. (1998). We Are What We Eat. Cambridge, MA: Harvard University Press. Gernmov, John, and Williams, Lauren (1999). A Sociology of Food and Nutrition. Oxford: Oxford University Press. Maltby, Richard, ed. (1989). Dreams for Sale: Popular Culture in the 20th Century. London: Harrap. Mukerji, Chandra, and Schudson, Michael (1991). Rethinking Popular Culture. Berkeley: University of California Press. Scapp, Ron, and Seitz, Brian, eds. (1998). Eating Culture. Albany: State University of New York Press. Sizer, Frances, and Whitney, Eleanor (2002). Nutrition Concepts and Controversies, 9th edition. Belmont, CA: Wadsworth Thomson Learning. Warde, Alan, and Martens, Lydia (2000). Eating Out. Cambridge, UK: Cambridge University Press.